There was a lot going in the 1960’s. This was the time of the generation battle, where the children who had grown up in a time of austerity and a cold war, rebelled and looked for something different – exploring, ignoring the boundaries but never quite finding what they were looking for. Martin Luther King and John F. Kennedy were shaping the future, and paying dearly. East and West were fighting, from Cuba to Vietnam. Europe suffered through the terrible winter of 1963. Who cared about a volcano no one had ever heard about? Even if it was one of the largest eruptions of the 20th century? Bali is different. This island of 4 million people has its own culture, and in fact was an independent kingdom until 1906, with a distinct culture. The island is not large: 150 km by 110 km. Most here is volcanic in origin, and those volcanoes, as elsewhere in Indonesia, are alive and active. Several are over 2 km tall. The highest is Gunung Agung, at just over 3 kilometer. The climate is monsoon, with a very wet December to April but little rain from May to September. Tourism is big business, and at times it seems most of Australia is here. It seems paradisiac. But when the fertile soil of paradise comes from volcanic ash, life is never totally secure. The eruption of 1963, little recognised in the rest of the world, brought devastation. Three volcanoes are located in close proximity to each other. Furthest east is Seraya, deeply eroded with no intention of every erupting again. In the middle is sacred Agung, with Bali’s largest temple, Pura Besakih; the climb to the top takes about four hours from there. West of Agung is Gunung Batur, 2150 meter high, with its enormous, 25,000 year old caldera. Visible further to the east, beyond Bali, is Rinjani, site of the enormous 1257 eruption, showing that this area has history. Batur and Agung both are quite able to erupt. But while Batur does frequent but minor, Agung does dangerous. Its 1963 eruption was a particularly bad one. Although there had been fumarole activity in the crater of Agung, the mountain had not erupted since 1843. On 16 Feb 1963, with Europe shivering in its worst winter for two centuries, earthquakes began to be felt in Bali, although not strong enough to do any damage. Two day later, 18 Feb 1963, explosive activity began, minor at first. Lava flows were first seen on 19 Feb, one day after the first explosion, flowing through a gap on the northern rim. The lava had probably first appeared together with the explosions the dat before, but this had not been seen. On 20 Feb, a pyroclastic flow which reached one village. These were the first casualties. Rain caused some lahars over the next days. Over the next four weeks the lava kept flowing although the amounts were not huge. The lava flow reached a length of 7 kilometer. It was 1 kilometer wide and over 50 meter thick; the volume over the next three weeks is estimated at 0.05-0.1 km3. The explosions now began to strengthen, and ash was rising as high as 3 kilometer above the peak of the volcano. From March 8, explosions were becoming severe. And so the main event began. At 5:30am on 18 March, major explosions began, lasting for 3.5 hours. The ash fell as far as 1000 kilometer away, in Jakarta. One of my secondary school teachers once told me that while he lived in Jakarta, he had experienced volcanic ash – and I think that may have been this eruption. Pyroclastic flows came over the rim of the caldera. Rain coming after the eruption caused lahars. These flows even reached the coast, destroyed villages and caused many casualties. This event took some of the pressure off. The source of the lava flow was cut off after it, and the lava flow slowly came to a halt. Lava refilled part of the crater but it did not overtop the rim again. After 18 March the explosions, although continuing, lessened in intensity and by the middle of May, the eruption seemed to be subsiding. But this was deceptive. On 16 May, there was another major explosion, lasting 4 hours. Again the pyroclastic flows came, and again there was major destruction, now mainly around the foot of the mountain. Two days later there was a larger earthquake, and more explosive events although not of the same size. The lava now stopped completely. After the end of May, the explosions became less, and although the eruption continued until 1964, from here on it was a minor one. But when the rainy season started, in November, the ash soaked up the rain, became unstable and started to move. This again lead to devastating lahars, and even more casualties. And near the end, Batur joined in with its own, unrelated eruption. By the end of the eruption, over 1100 people had died and the economy of Bali had been devastated. During the first four weeks of the eruption, lava flows and explosive activity occurred at the same time from within the caldera. It seems problematic that these came from the same location; more likely is that there were several vents in the caldera, some giving phreatic explosions and one or more expelling lava. But no observations were made within the caldera. It was, after all, during the peak of the rainy season. The ash of the 17 March eruption was blown to the west, covering all of Java. On the slopes of Agung, the layer was up to 50 cm thick, and it reached 0.1 cm in Jakarta. The ash of the 16 May was less widespread, and was blown mainly the the north where the layer reached 40 cm in depth. Much was blown out to sea, and some fell 175 km away on the island of Sempanjang. Pyroclastic deposits are found in the valleys on the slopes of the volcano but it appears they did not reach much into the low lands. Instead, the major damage was mostly done by the lahars, which was partly due to the fact that the main event occurred during the rainy season. In a way, this was a foreshadowing of what would happen later at Pinatubo, where the eruption coincided with a typhoon. So how much did this 1963 eruption erupt? The ash layers are fairly well mapped, and summing everything up suggest that the 17 March event caused 0.4 km3 of ash. The 16 May event is less accurately mapped, but it is estimated at 0.3km3. This is fresh ash: the dense-rock-equivalent (the hole in the crater it left) is less, and this is estimated at 0.28 km3 in total. Adding the lava makes the total eruption 0.4 km3 DRE. The precise cause of the event is not known, hampered by a lack of observations. The deposits show that two lava types mixed in the eruption. Self & Rampino suggest that older, andesite magma was already present, and that in Feburary 1963, new basaltic magma was injected into this reservoir. This resulted in lava filling the crater and causing the highly viscous lava flow. A second pulse of fresh magma high in volatiles caused the 17 March explosion. The magma became capped, but in May this cap broke because of the pressure from below, and a new explosion occurred. Although the ash cloud was only reported to be 10 km high, it likely was much higher than this. The eruption rate makes it likely that it reached twice as high, 18-20 km. In fact, a year later a plane measured some ash from this eruption at 20 km altitude. Not only had the plume reached the stratosphere, some of the ash there stayed aloft for a long time. 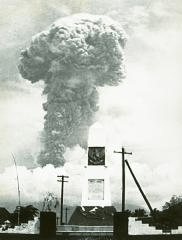 After 1964, Agung went back to sleep, and the people returned to the local villages. The mountain would sleep for over 50 years. But now, a prince has come and kissed the sleeping beauty awake. A new injection of magma has taken place, and since a week there is explosive activity. I today’s event, like in 1963, the ash is reaching some 3 kilometer above the mountain, 6 kilometer above sea level. And again it has started close to the rainy season. It is difficult to predict how this will evolve: If it remains similar to 1963, the next step will involve lava, which may be viscous and slow moving. However, eruptions rarely do copy each other. There are lessons, though, and they show that the biggest danger is not from the lava, and not even the pyroclastics. Once the rains come, the biggest danger is from lahars, coming down the river valleys. Following those valleys, they can reach far beyond the mountain. Agung has history, and the history shows that this sacred mountain should not be taken for granted. The current eruption may end without much more activity: volcanoes do as they please and if we are lucky, the gods have now ben satisfied, the prince giving his marching orders, and the mountain allowed to fall asleep again. However, if it behaves as in 1963, this may just be the beginning and we could be in for a dangerous few months. Only time will tell. Self, S., & Rampino, M. R. (2012). 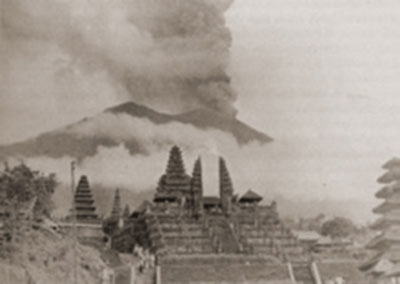 The 1963-1964 eruption of Agung volcano (Bali, Indonesia). Bulletin of Volcanology, 74(6), 1521-1536. This is my first time posting! I have been here for a very long time, reading everything just so I can learn. The VolcanoCafé community is so knowledgeable, nice and respectful so I wanted to be part of it. I will mostly post my questions and hope to learn more. Off to bed now but activity seems to have ramped up a bit – not good. Hopefully it will calm down a bit again. Lots of low level cumulus in the foreground now as the warmth of the day takes hold on the N cam so getting hard to see. S cam less cloud but obscured by falling ash but plume looks very large at the mo. Darwin VAAC 2017/24 for Agung shows no change in plume height. Still cranking out at 98.58 m³/s. 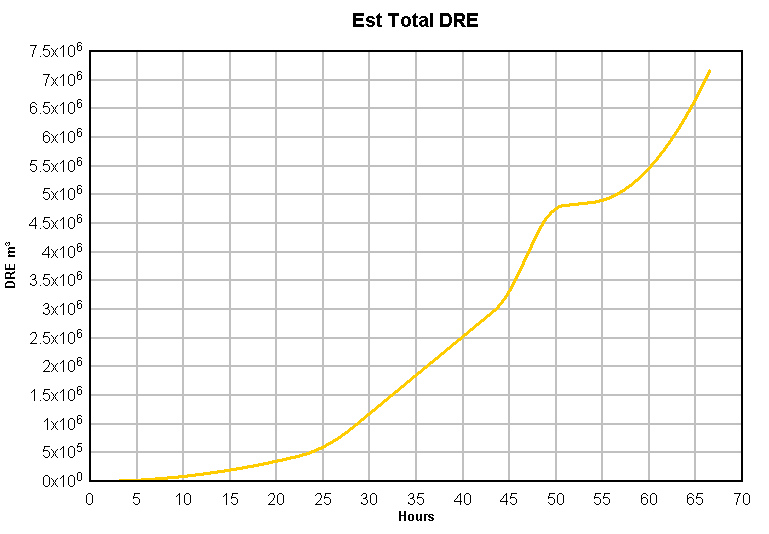 Total volume is now up to around 4,268,649 cubic meters DRE. For reference, it would have to maintain this level of eruption for 48 days to get close to the 1963 eruption, not including lava flows. Darwin is leaving the FL300 warning up, but observed height is at FL200. That equates to about 5.04 m³/s mass ejection rate. Less noise on the drum the last hours. No camview to tell if it goes with less ash production. Someone know a cam wit a view? No view, but watching Darwins reports. Despite the tremor growing fat again starting about 3:26 UTC, the current advisory shows the same GL200 observations with warning about ash to FL300. Not trying to diminish the event, but so far this is generally a pretty sedate eruption. That doesn’t mean it can’t get full on stupid. Volcanoes are notorious for doing surprising things. For the grammar twits; “full on stupid” → a colloquialism for “really bad.” Actually, worse than bad. “full on stupid” is where a persons reality begins to break down from what is going on around them. Any and everything you do is stupid no matter how well thought out the action is. I’ve been in such situations only about twice. Afterwards, the only thing that comes to mind is “How did I survive that?” Because you are genuinely curious. Logic dictates that you should be a grease stain or a smudge on the ground, but there you are wandering around fat dumb and happy. You mean “Mad as a box of frogs”, right? The only boxed frogs I ever had were really calm about it. Don’t ever let a little thing like truth get in the way of a good story ! Is that the lawyer speaking? I am afraid that is sub judice ….. or something. Ramping up again.. Curious to know how far the sounds from the eruption travel. Can it be heard from the webbcam positions? Dunno. When Kelud exploded, there were reports of it being heard up to 200 km away. Must be a terrifying sound for those nearby. Now the drumplot went flat since some hours so maybe the action is pausing for now. “The volcanic eruption has now moved on to the next, more severe, magmatic eruption phase, where highly viscous lava can trap gasses under pressure, potentially leading to an explosion,” Mark Tingay, a geologist at the University of Adelaide’s Australian School of Petroleum, said in a statement Monday. Maybe thats why the flat drumplot line. Pressure is building up.. Detailed picture of two seperate ash columns which appeared today in the morning. If only we could have a web cam at that angle. Looking at the bukit asah cam, when the clouds alllow, i did feel the main eruptive ash (dark) column is coming from the left hand side of the crater. The steam plume that we have seen over the past few weeks and first couple of phreatic blasts were located to the right of the crater rim on that camera. I suspect this photo is an opposing view to that web cam so maybe the white plume is the original steam plume but now on steroids? Here’s different views of Agung eruption so far from Tony’s – 24/7 Eyes on youtube. Well after a boring 2016 and almost boring most of 2017 (the new lava flow at erta ale could have been nice if it was actually accessible…), something really seems to be happening. Several volcanoes in Iceland threatening to erupt ‘soon’ and now the possible (probable?) start of a significant/major eruption at a known big-erupting volcano in a tourism hotspot… This time last year I would have thought katla would be the most likely next big eruption, both in iceland and the rest of the world, but now I would pick agung or oraefajokull instead. maybe the Pliny 2017 will go to a volcano that actually has a plinian eruption. Lets see what the last month has to offer. 2018 I predict will be a bigger year for volcanology than 2016 or 2017. Scientists are predicting more and possibly larger EQ activity for 2018, is that likely to affect volcanic activity also I wonder? Bukit Asah cam is about 8 km west of the Agung crater (I think) and the Rendang cam is about 13 km southwest of the crater. In that case i really do hope the lights showing in the valley on the Bukit cam is a case of people not turning them off before evac’ing. Dr Krippner tweeted that some people have not moved from the the exclusion zone based on the area they are in having not been effected in 63. Large white glow at the moment. I think the lights are in the ‘safe’ area but I am not sure how they estimate a safe area because if they are basing it on the ’63 eruption then surely it could be possible the crater walls, which could still likely have been damaged in the ’63 eruption, may give way in unexpected areas? I personally I would prefer to be on the other side of the island where I knew it would be safe. Quite a neat little synopsis from the BBC News Website: http://www.bbc.co.uk/news/world-asia-42133502 . Interesting comment on the two vents – matches up with what I saw a days or so back, a steam column in front of the ash column (as seen from Bukit Asah. #Agung volcano eruption, Indonesia. Continuous ash emissions 30,000 ft altitude. Exclusion zone increased to radius of up to 10 km from the crater. 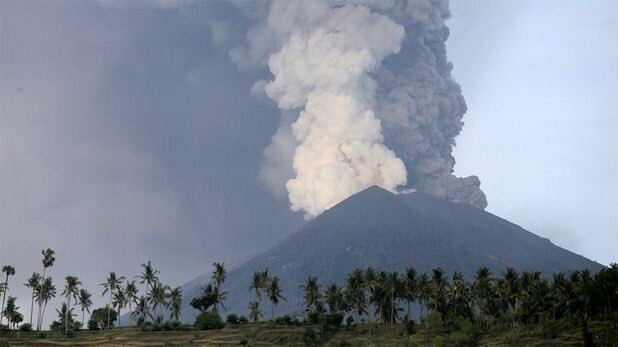 Agung raised to highest level 4 alert. The lava fountain in the Agung volcano is visible, and it’s a thunder storm going on in Bali now. Is that a normal thunderstorm or is it ash cloud related? Glow is visible on the cctv cameras this morning. The glow is strong enough to give reflections in the camera. I have the impression that the glow is seen against the steam cloud, not the ash cloud, but I am not 100% sure as the angle of the photos with the steam cloud is not always clear. If 1963 is the pattern, the lava will fill more of the summit crater until it finds a gap. Whether that is the same gap as in ’63 depends on how much the rim was changed by the two explosions in 63. The lava flow at that occured before those explosions. I still think that lahars will be the main danger. From the evacuation area, it seems that the people in charge expect these to reach the foot of the mountain but not much further. Albert, I don’t know if anyone has posted this here yet but the crater rim appears to have already recently (last day or so) crumbled in some areas and the rim is lower so those areas on the map for lava flows may not now be applicable for this year. Two different coloured plumes can be clearly seen now. That is as bright as i have seen it at night! and that is with night cam… if there in person i think it would be red…. right ? anyone?? RT via LastQuake RT David_Bressan: Mount Agung (2017) & volcano on Ternate (1680) showing eruption columns of different colors. One has a higher ash content (darker), the other has a higher steam content (lighter). Is the brighter plume not magma now as it is really bright and glowing is a steam plume more of a clearer thin cloud plume ? Although it was clear in daylight that there were 2 different plumes, I think what you’re seeing here has more to do with the relative positions of the clouds and the source of the brightness. Those clouds in front of that source appear dark, as the light is not fully penetrating them, whereas it is lighting up those behind it. There seem to be two seperate plumes though the one of the left is darker spewing out Ash and the one on the right is brighter spewing out Steam/Magma dont think this is anything to do with the light? I agree Janet, light steam from a separate source from the dark ash plume. At least two separate eruptions in the same crater. I have heard that there could be three plumes and sources but I don’t have proof, to my satisfaction at least, of that. Amazing with such a smooth drumplot with so much visible activity. The output routes must be open enough to balance the pressure.. Remarkable thin drumplot line. The emission goes smoothly and a lot of heat escapes with the water-rich ash and steam. If water gets boiled off and temperature rise. Whats the next level of activity? An interesting tidbit: I found a total of 516 people have died since 2000 due to volcanic eruptions (I may have missed a few eruptions). Of those, 376 died in Indonesia, the majority during the Merapi eruption of 2010. And worth noticing: of the five most deadly eruptions worldwide, 3 were VEI3 or less. In fact, the most dangerous eruptions are minor ones that go off with little or no warning. If there is time to prepare, authorities do remarkably well. In the case of Merapi, the majority of casualties were from people who stayed put inside the evacuation zones. Let’s hope this eruption does not add to that number. Sadly though, it seems that people are not taking their own safety too seriously. Just look at the lahar videos. People are way too close. Those things can grow a lot bigger in a very short time and then those people will be in trouble. Also, staying inside the evacuation zone, feeling safe just because a particular village wasn’t hit by the 1963 eruption, is a good way to get yourself killed in case it suddenly decides to go big. Let’s hope they decide to move on before that happens. The lahars in Bali are not likely to get too huge as they are caused by the tropical monsoon rains on the ash, not from melting ice as from some volcanoes. However, having said that I would always have one eye on the lahar and one on my escape route. The Indonesian authorities learned a lot from Merapi. Also, the local population learned even more. One could say that the tremendous success of Kelud and (so far) Agung are the result of the Merapi catastrophe. One could do well by studying how they do it in Indonesia. I agree that their record is impressive. The problems they have are significant, though, with high population densities on the plains and slopes of the volcanoes. By this time last century there were tens of thousands dead, mostly in the 1902 mt pelee eruption (29000 or something), but probably about the same amount from other eruptions between 1900 and 1918. And that was with 1/3 of the population that existed in 2000… So I guess volcanology has been much more successful this century than most people realise. i would suggest that there has been an obvious erosion/collapse of the rim on the left hand side. Looking at the daylight image, moving to the left of the small steam plume you see a small outcrop almost dead centre of the crater rim. That outcrop still seems to be there on the silhouette, however moving further left there should be a second larger outcrop. The night time view now suggests that this is missing and there may be a sizeable gap in the rim at this point. Well, I keep watching and it seems like every time I look at the image on the cctv view I see a face or a picture with the dark and light emissions. At 23:39 I see Pluto, the Disney character. Now on the look out for sharks, dragons and sheep! glow is almost gone.. wonder what the drum is doing?? Fairly quiet. Less noise (far less) than 24 hours ago… And even that could be just weather related. Other than that, no major spikes in 10 hours or more. Perhaps water rich materials have boiled off. Now heat may increase to next round of action? Drumplot line flat. Very smooth eruption! So, for us without BC access, what was the message? It was said the eruption as it is could go on for over a year and that no one can predict whats going to happen at all. Around 2:27 camera time some clouds or rain move in and obscure the thermal image. Multiple lighting strikes away from mountain indicate rain in the area. Look to the far left of the light source and the area where the depression can be seen against the glow is the area on the crater rim that has collapsed . Haha, light changed already! Look when it becomes bright again! Lightning that happened a minute ago was bright enough to see good view of Agung and ash column. Ah yes and once again one can see where the crater wall collapsed at the far left off the lit plume. Looks collapsed as you say. So thats the place were a lava flow may start.. Directed towards north. Eruption column clearly visible lit from below at the mo. Very spectacular, especially when combined with the lightning! Now it actually looks like a small lava stream is finding its way on the south rim! I’ve been looking at that too, however, it’s not visible on the other cam. Actually nothing is. Must be behind the main eruption plume. It would be good to see where these cameras are positioned on a map. The Rendang cam isn’t working at the moment. hopefully they get it working tomorrow. The Bukit Asah cam is about 20 km south of the volcano (I think 🙂 ), near the coast, village Bugbug. It is a popular viewing point (says Tripadvisor). Looking for the spot with the name is a bit confusing though, it means “flat hill” and there are more places with that name. 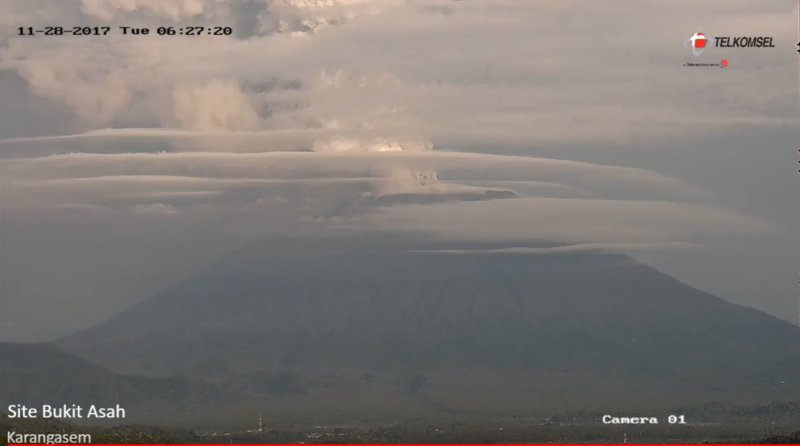 The cam Batu Lompeh is north of the volcano (my guess through FB), about15 km away from the agung. Please scroll through http://www.vsi.esdm.go.id/index.php/gunungapi/kamera-gunungapi to find it. I am wondering what the gain setting is on the seismograph. There was a fair-sized earthquake (M6) this morning, around 7am (UTC) in PNG, which could have been visible on the trace but nothing shows. Maybe thats why the eruption seems so smooth in the drumline.. 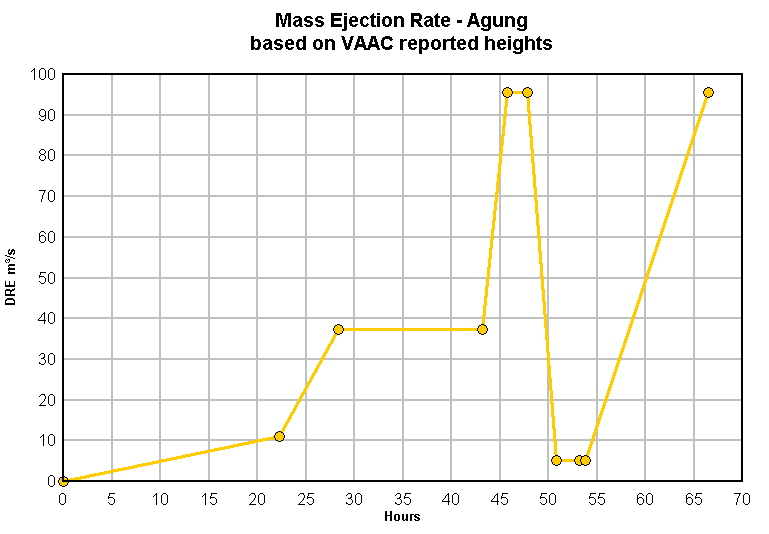 I may have missed an update or two, but based on what I have, this is the ejection rate of Agung. So, Agung is strombolian type volcano. VEI 3 should be reached today. But I try to understand what explosive index has to plolonged eruptions ? And THAT is one of the main problems with the VEI scale. A prolonged sedate eruption can rank higher than a highly explosive short eruption. Activity has declined to FL250. The plume does look thinner and lighter. Yep. Darwin update 2017/31 states so. 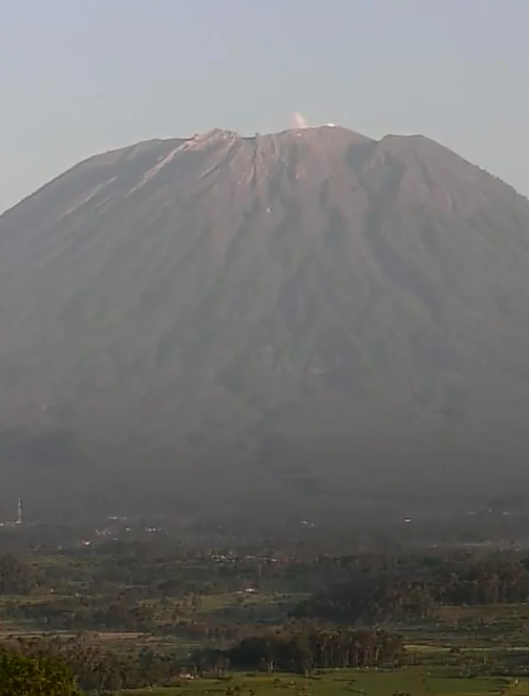 Screenshot of Gunung Agung this early morning local time cam Batu Lompeh. The volcano is a bit over 3000m. high, so the ash cloud reaches about 4000 m. above its summit at this moment? Is Gunung Agung able to erupt with VEI6 force, or even higher now? Personally, I don’t think so… unless the edifice has a collapse. At the highest ejection rate that it has shown, VEI-6 would take 3.32 years of nonstop activity at that level. The fact that it is actively venting lowers the potential for a catastrophic event. Does make one ponder on what a run up to a VEI-7 would like in these Sundra Arc badboys, let’s hope we can ponder for a long while yet..
Gunung Agung is venting a lot of steam now. Is this water vapour released from the magma inside the conduit, or is it groundwater boiling inside this volcano? Actively venting decreases the pressure inside the volcano, unless there’s is a constant influx of hot fresh magma from the subduction zone into the magma reservoir below. Before the cataclysmic VEI 6 eruption of Pinatubo in 1991, the volcano was also actively venting steam and ash. How big is the magma reservoir below Gunung Agung? The size of a magma reservoir and the amount of eruptible magma inside it determine the the strength of any eruption. Popcatapetl is feeling left out and is kicking off big time! About the same level of activity also. That flank of Popocatepetl doesn’t look like the most stable thing in the world. Hope the event keeps winding down as it seems to be doing. A think, there is an interaction between volcano hot ash column and outside clouds / storms. I wonder what cause lahars? Soon as Agung aruptions started, some floods were reported in south Bali. A classic Lahar forms from ash or altered rock that begins flowing downhill. Usually this involves water, though once mobilized, the material itself can act as it’s own fluid mechanism. Ultimately, it’s all because of gravity. Dunno if it has to be current rain though. The top of Ranier is rampant with altered rock and in my opinion, all it will take is one good quake to put it in motion. Note: “Good” in this context means “significant,” not that a quake could be considered a good thing. For most people, it’s actually quite bad. I just have figured out, there is a tropical storm south of Java, which impacts on weather in Bali, as we see on webcams. This is coincident. And this is what happens when a river channel gets filled up with the debris from lahars and the general ash filled runoff from rain. Yep. Quite dangerous stuff. 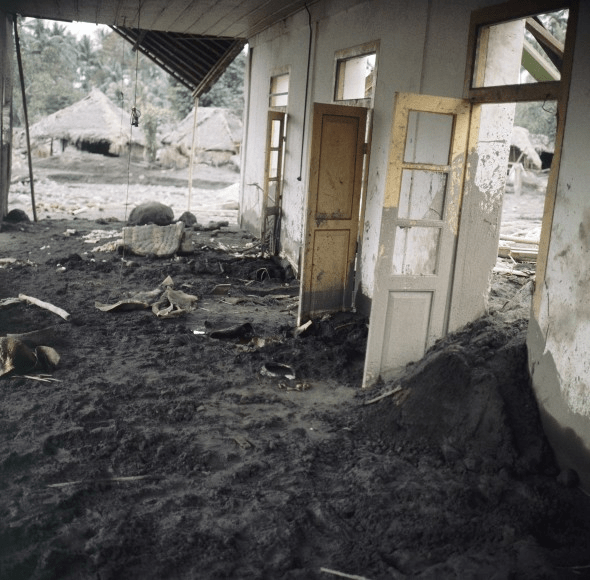 Armero was 47+ km from Nevado del Ruiz and lost 20,000+ people in the middle of the night. Whats the possibility of VEI7 eruption, similar to Tambora 1815 or Samalas 1257? Event so bad and destructive, that Agung lose about 1/3 of her height? Or what are these probabilities for Öraefajökull, within few years? Just looking at the cctv cameras it looks like Agung is settling down a little? GL Edit; 1st one removed by request. Doesn’t look like it currently. Top winds blowing ash column, but still looks quite strong. The plume looks like it has black pin pricks in the clouds now. Major change in seismograph. Fully saturated. Yeah, i wonder what that means??? guess we’ll find out…..